Jurassic Quest is set to fill about 100,000 square feet of the Convention Center with dinosaurs. There's a question that people keep asking Chris Arnold, and it's about dinosaurs. Because Arnold's career revolves around dinosaurs, you might think he knows the answer, but no matter how many times it's asked, he can't articulate exactly why we're so fascinated by the prehistoric giants. "I was that way. I had dinosaur books and dinosaur toys. Until I got into sports much later, I think it was my first obsession," says Arnold, who oversees the installation of Jurassic Quest, a massive animatronic touring dinosaur exhibit taking over more than 100,000 square feet of the Spokane Convention Center this weekend. The show now features more than 50 life-size dinosaurs, having expanded significantly since its previous stop in Spokane. Kids can ride some of the dinosaurs. They can go on a "fossil dig" or a guided tour, and learn all the names of the dinosaurs and walk away probably more obsessed than they were upon entry. Their parents aren't going to mind seeing any of this, because they probably love dinosaurs, too. I was a dinosaur-obsessed kid. I slept beneath a triceratops bedspread and dried off with T-rex towels and scoured library shelves for whatever books had the most pictures of the brontosaurus (more on that later). I forced my parents to buy me terrible B-movies like Planet of the Dinosaurs out of discount VHS bins, which taught me little about the Jurassic age, but a lot about gratuitous bikini scenes. Like Arnold, baseball cards and comic books took my obsessions in different directions, sending my collection of dinosaur toys, books, movies and T-shirts to the hand-me-down pile. But then there was Jurassic Park, the 1993 film that reignited the dinosaur preoccupation in not just me, but much of Western civilization. When I saw that movie, I couldn't have been the only one who assumed that it was a matter of time before some scientist found the right mosquito holding the right DNA to recreate a dinosaur — despite the film franchise's continued insistence that doing so will lead to a catastrophic loss of human life. "Dinosaurs can be kitsch and kids stuff. But they are not only that. We have felt the persistent beckoning of their bones and found our own place in Earth's history by trying to unravel Mesozoic mysteries. Not only did dinosaurs shape the evolution of our ancient mammalian ancestors, which skittered around for over 150 million years in a dinosaur-dominated world, but they have been a milestone for us to gauge our own history and evolutionary success against. Without dinosaurs, we would not be who we are." Swetik goes on to say that this fixation isn't going anywhere. It's true today. While our world has changed drastically since my 1980 and '90s childhood, kids are drawn to dinosaurs, even if that means looking at them on an iPad rather than digging through library stacks. My son is 3½ and he loves the hell out of a T-rex. His little sister is proud of her triceratops jammies. And while last year's Jurassic World was a horribly written story, helplessly lazy on the scientific details, you have to believe it awakened this fascination in a lot of adults. The movie sold half a billion dollars in tickets in its first weekend. It takes eight full-size semi trucks to bring the Jurassic Quest show to Spokane and other cities across the country. The company makes efforts to change out the dinosaurs and exhibits so things don't get stale. "We tripled in size over the course of a year. We wanted to make everything better. If the same kid comes again, there's going to be different stuff," says Arnold. Part of those improvements was devoting more resources to making the exhibit scientifically accurate. Jurassic Quest brings in a paleontologist to help advise on the construction of the models and the production of the show's tours and other features. "At first we had some flaws that were inaccurate to time periods, and we've been able to fix that," says Arnold of their expert help. 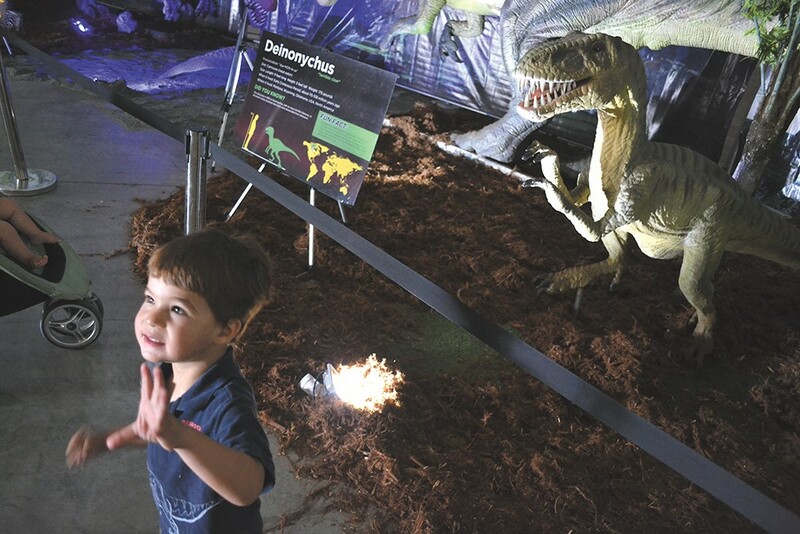 Jurassic Quest employs a paleontologist to ensure the exhibits are realistic. The fact that dinosaurs are a scientific moving target is, perhaps, part of our obsession. When kids first began getting interested in them, Luis and Walter Alvarez had yet to advance their hypothesis that the dinosaurs were wiped out by a massive asteroid impact. And for a long time, my favorite dinosaur was the brontosaurus. Later in life, I was told that the long-bodied sauropod was actually an Apatosaurus. "The dinosaurs we meet as children don't stay around for long," says Switek in his book. "Skeletal reconstructions and restorations are often taken as the last word when they are really working hypotheses, open to change and revision."